Part two of our voter guide covers propositions addressing housing issues and healthcare. Read on for our recommendations on Propositions 5, 8, and 10. Prop 5 sounds like a good idea at face value, but it’s actually incredibly complicated, unnecessary, and could create new budget shortfalls for local communities. To understand Prop 5, it’s first necessary to understand Prop 13, which was passed in 1978. Prop 13 requires that property taxes be based on the assessed value at the time of purchase, with only very small adjustments for inflation over time. In other words, while home prices have skyrocketed in California, property taxes stay very low, and the advantage to the homeowner only gets bigger the longer they stay in their home. For some homeowners who have been in the same home for decades, they may be paying property taxes on an assessed value in the tens of thousands for a home that would sell in today’s market in the millions. While Prop 13 provides a level of certainty for homeowners, it’s also a massive giveaway to California’s wealthiest residents. When Prop 13 passed, it led to immediate state budget shortfalls, and some estimates claim it costs California as much as $30 billion every year in lost tax revenue. There’s even an argument to be made that our relatively low property taxes contribute to our outsized home prices (and the accompanying housing affordability crisis) by lowering the long-term costs of homeownership, making it easier to justify paying a higher price if you know your taxes will never go up. Back to this year’s ballot, Prop 5 would allow homeowners over 55, and those with disabilities to transfer their current property tax assessment to a new home, with some adjustments. Proponents of Prop 5 would argue that older homeowners shouldn’t be faced with higher property taxes if they want to downsize to a smaller home. However, Prop 5 is unnecessary as previous adjustments to Prop 13 already make this possible. Prop 60 (passed in 1986) allows homeowners over 55 to transfer the taxable value to a new home of equal or lesser value within the same county, and Prop 90 (passed in 1988) allowed the same benefit to extend across county lines, as long as the new county agreed to participate. To make matters worse, Prop 5 would actually allow for reductions in property tax values if the new home is assessed at a lower value than the current assessment of the original home. (See the examples at Ballotpedia for how the adjustments would work.) None of these tax transfer initiatives have been necessary because property taxes are already the single most predictable cost of owning a home in California, and the benefit of this tax break only really benefits the same people who have already reaped the astronomical benefits of Prop 13. 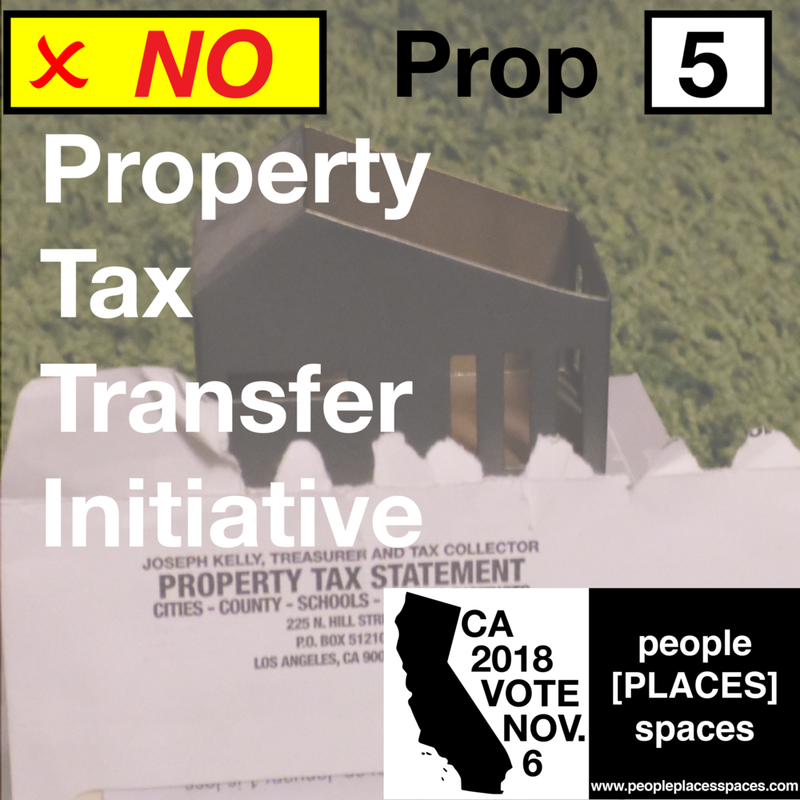 Prop 5 is a shallow ploy by real estate agents to encourage an already well-off segment of Californians to put their houses on the market with yet another property tax break at the continued expense of state and local coffers which fund vital services, including schools. Vote NO on Prop 5! 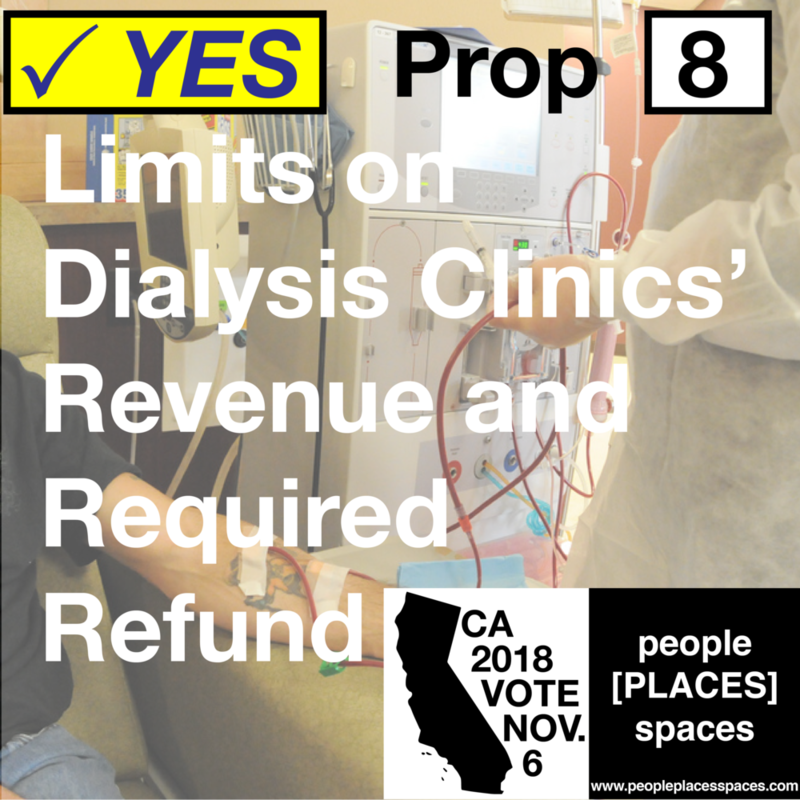 A vote in favor of Prop 8 would cap dialysis center revenues at 115% of costs, that is, it would limit the profit that dialysis centers could generate to 15%. This doesn't necessarily hold costs down, but it does limit how much of those costs can funnel upward to executives and investors (for context, three major dialysis companies are spending a combined $99 million in an effort to defeat this measure, so we’re talking about A LOT of revenue that is not being invested in patient care). Under Prop 8, if the dialysis centers want to charge their patient and their patients’ insurers more for investing in staff, providing translation services, and generally keeping up their centers, they could very well do so. What dialysis centers will not be able to do is skimp on these needed investments in order to pocket more of the money for themselves. While this proposition has generated a fair amount of confusion (maybe because of a flood of misleading information coming from the dialysis companies funding the “no” campaign?) and has led to many progressive organizations to either sit this one out or softly encourage voters to vote no, we think the need to address poor quality health care is paramount, and a creative measure like this will have a net positive effect on patient care. Opponents of the measure seem to make the argument that we must accept poor quality healthcare, or have no healthcare at all. We believe we should demand better health care, and demand that more of the money spent on healthcare go toward actually providing a higher quality of care. Vote YES on Prop 8. Prop 10 is probably the best initiative on the ballot this year. Despite what you may have heard, Prop 10 does not actually impose rent control anywhere. It would merely repeal the Costa-Hawkins Act, which essentially froze all existing rent control provisions in the state in 1995, and prevented any new rent control measures. For example, here in Los Angeles, a city law passed before 1995 caps annual increases in rent for tenants in apartments built prior to October 1978, but Costa-Hawkins prevents the city from updating that law, or moving the effective date to encompass more recent construction. Costa-Hawkins is a blunt instrument that preempts local control on a local issue that the state legislature should have no say in. It makes no sense that legislators from the Central Valley should get to determine how rents are regulated in Los Angeles or San Francisco, just as no one would expect that rent regulations in California’s big cities should be equally applied to the state’s rural areas. 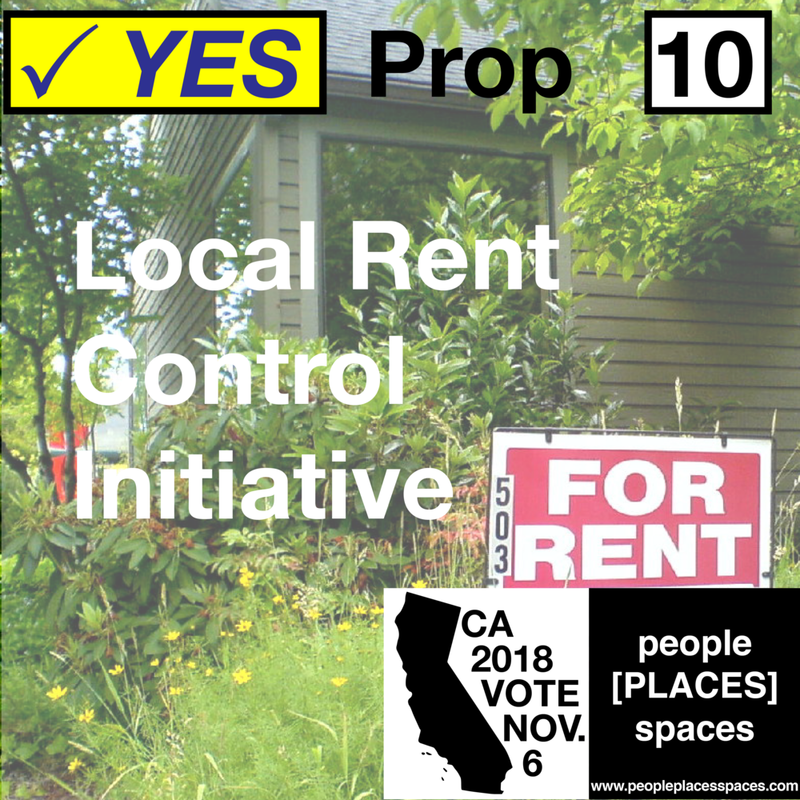 Opponents argue that rent control puts downward pressure on housing production and limit landlords’ ability to upgrade their properties, but laws already allow landlords to pass the cost of upgrades through to tenants in rent increases, and any speculation on the effects of Prop 10 on housing production are purely hypothetical and irrelevant because Prop 10 does not enact rent control! Further, hand-wringing in anti-Prop 10 advertising over a lack of protections for X, Y, or Z group of renters is purely specious because Costa-Hawkins also has absolutely no protections for any renters of any kind. Costa-Hawkins does nothing to help the housing situation in California, and it needs to go. Renters, especially in California’s most expensive markets, deserve at least some modicum of certainty in their long term housing costs, and we should give local governments—the ones best able to understand the conditions of the local rental markets—the option and the freedom to determine the appropriate parameters. Vote YES on Prop 10! Yes on Props 1, 2, 3, and 4: spending money to make our state better. If you take nothing else from our voter guides, please vote NO on Prop 6. Also, No on Prop 11 and Yes on Prop 12.